Poultry production on hold for the Summer of 2017. We will only be raising pastured chicken and turkey for family consumption as we have shifted our focus to growing vegetables on the property and this involves a large time commitment. In our first year of Salatin-esque pastured meat chickens, we raised 200 chickens from day olds to the age of processing (10 – 12 weeks). Meatkings aka. Cornish cross are broiler chickens that have been selectively bred for rapid muscle growth and savory taste. The delectable taste comes in large part from the time spent foraging on pasture during their lifecycle. 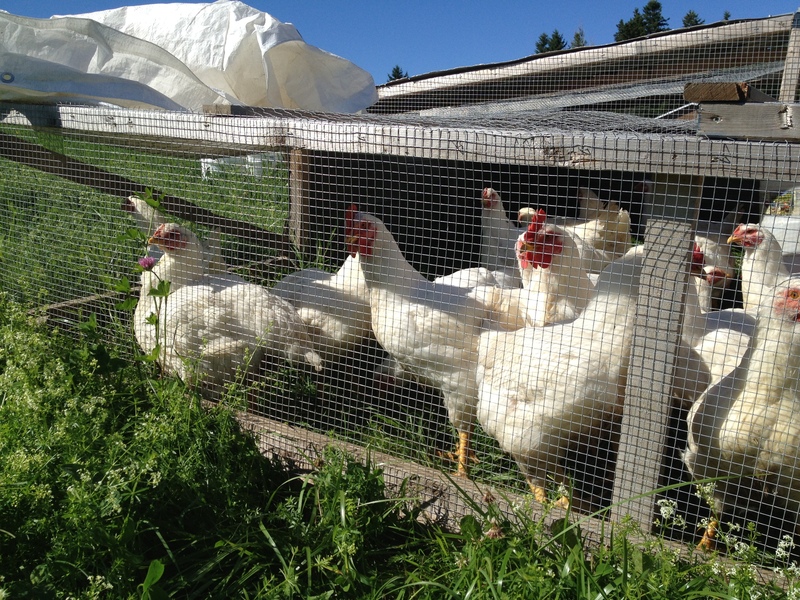 From the age of 3 – 4 weeks the birds enter pasture in their portable chicken tractors (otherwise known as pens) where they mow down 10’ x 12’ plots of grass daily leaving their nutrient rich manure behind them. 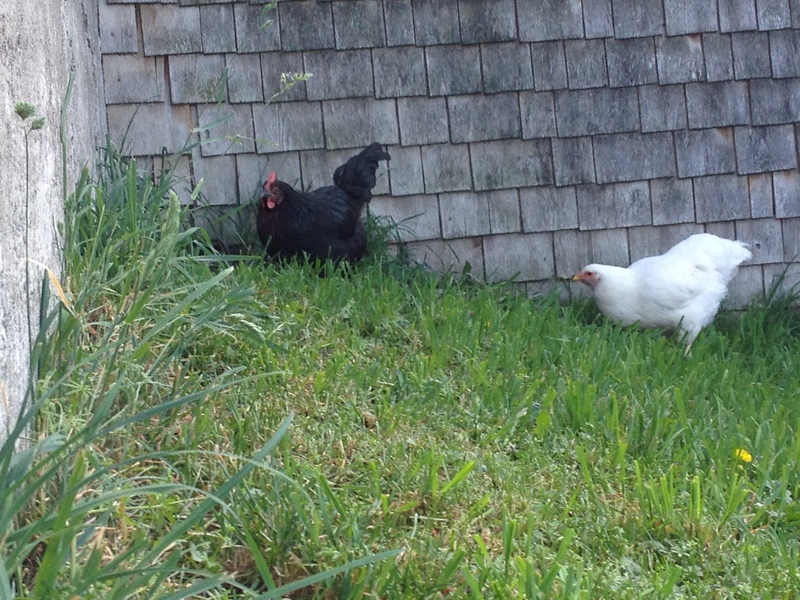 In this symbiotic relationship, the chickens receive a nutrient-rich salad bar of perennial grasses, clover, dandelion greens, other plants, and grub that is more in keeping with the natural foraging behavior of wild chickens. While they are still in their brooders, we train the chickens to like the taste of dandelions, which facilitates their transition to pasture resulting in approximately 25% of their diet coming from the hayfield. Chickens also receive local grain, ground crab and clam shell, and seaweed. This whole process brings about a better balance between animal husbandry and land stewardship by allowing chickens to be chickens and minimizing the amount of travel on the hayfield with farm machinery. Plug in the rotisserie, invite your family and friends over, and enjoy a chicken raised right inside your local foodshed. Enjoy! New Hampshires, Black Australorps, Rhode Island Reds, Barred Rocks, Silver-Laced Wyandottes, Delawares, Speckled Sussex, and Canada’s own Chantecler. We believe in raising dual purpose birds that can be used as stewing hens after their egg laying production ceases. We raise our chicks from day olds and put them on pasture where they stay in portable range huts that are surrounded by solar powered electrified netting to keep predators out. Heritage breed chickens have their natural chicken instincts intact, forage well on pasture, and lay a variety of different sized eggs. They are very well suited to pasturing models. In recent years, efforts have been made by breeders to save the heritage breeds from extinction and endangered status as many farmers have switched to production crosses with higher laying rates and more efficient use of feed. For many, the heritage breeds, elicit memories of mixed barnyard flocks from times gone by. We sell our eggs from farm gate and at the local Restigouche Farmer’s market in Dalhousie. It is important to note that pastured egg production is seasonal and when winter weather hits the birds are off pasture. At this time they receive local grain and surplus produce. Let’s get crackin’ and make MacCurdy eggs part of your local culinary experience.